Based upon primary research conducted with industry representatives across the value chain, this report presents the results from T1.2 and provides a roadmap of potential business strategies and collaboration opportunities between actors for LV Grid Flexibility Management in the context of a market place in transition from a non-functioning flexibility market of today to a functioning flexibility market of tomorrow. 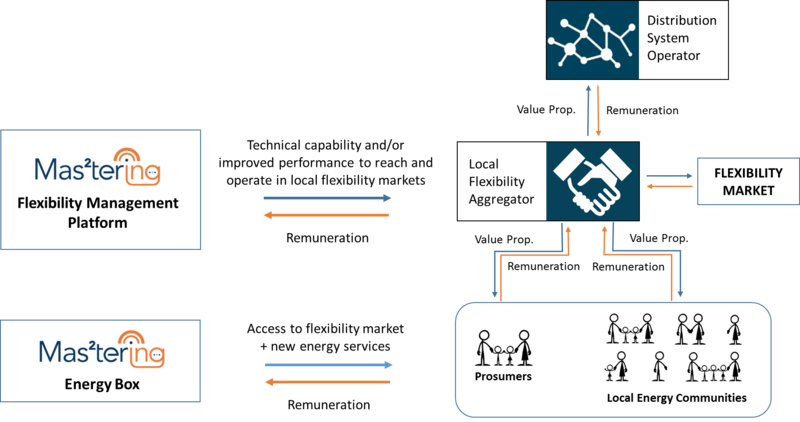 The report starts with conceptualizing the Local Flexibility Market Model from a multi-sided platform perspective as illustrated in the Figure below. The report gives a detailed description of the entities, roles, structure and functioning of the new flexibility market design. Central to the market model are: Prosumers, Local Energy Community (LEC), Local Flexibility Aggregator (LFA), Supplier, Wholesale Market Aggregator (WMA) and Distribution Service Operator (DSO). Next, utilizing the business modelling methodology of value network analysis, the report details the value flows within the context of a multi-sided platform to understand how value is created, delivered and captured in a network of interdependent relationships. This facilitated the development of a five-sided business model for the LFA as illustrated below. The report also provides detail around mini-business models for each customer side (Prosumer; DSO; WMA, Suppliers & Other LFAs) in order to signify their own distinct product offerings which require unique value propositions and the individual revenue streams that they create for the LFA. Regarding the LFA multi-sided business model (LFA-MSP) as the business opportunity, this report then identifies the business strategy and rationale for an actor or actor collaborations to adopt the LFA business model. This forms the basis for three potential business cases to be identified that correlate to the project use cases. 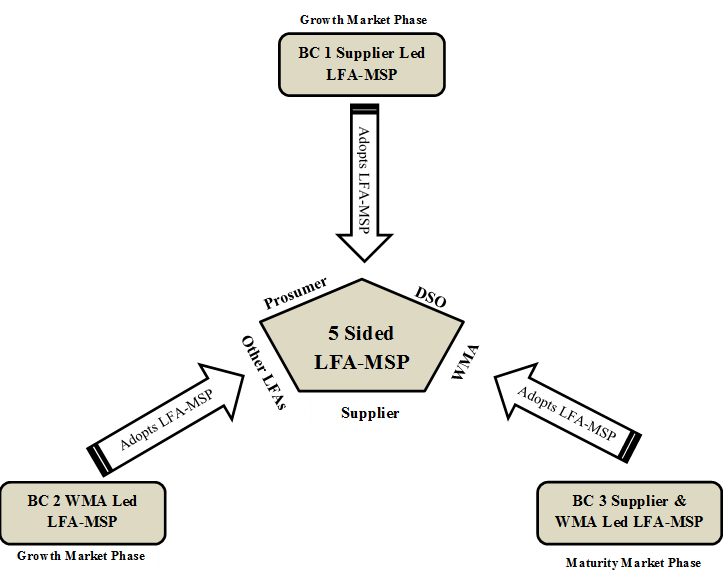 These are a supplier-led assumption of the LFA-MSP business model opportunity (Growth Phase), a WMS-led assumption of the LFA-MSP (Growth Phase), and a combined or paired assumption of the LFA-MSP (Maturity Phase). Business strategies and collaboration opportunities also account for the evolution of the local flexibility marketplace where it is today, to pass through a growth phase and eventually to a fully functioning flexibility market in the maturity phase. Finally, this document provides a description of the Mas2tering product and business model and how it relates to a multi-sided market place, the Local Flexibility Aggregator, Wholesale Market Aggregator, Local Energy Communities and Prosumers. The findings from this report provide direct input to the business model validation activities in the next WP1 deliverable (D1.7 MAS2TERING Business Models) where a cost benefit analysis will be conducted on the business cases identified. 1.1 Purpose, Scope and Objectives of Deliverable. 2 Local Flexibility Market Model: A Multi-Sided Business Platform. 2.2 Reconceptualising the Market Model as a Multi-Sided Platform. 2.3 The Role of the Actors in the LFM. 2.4 Who will be the Platform Owner and Occupy the Central LFA Role in the LFM-MSP? 3 Building and Designing the Multi-Sided Business Platform. 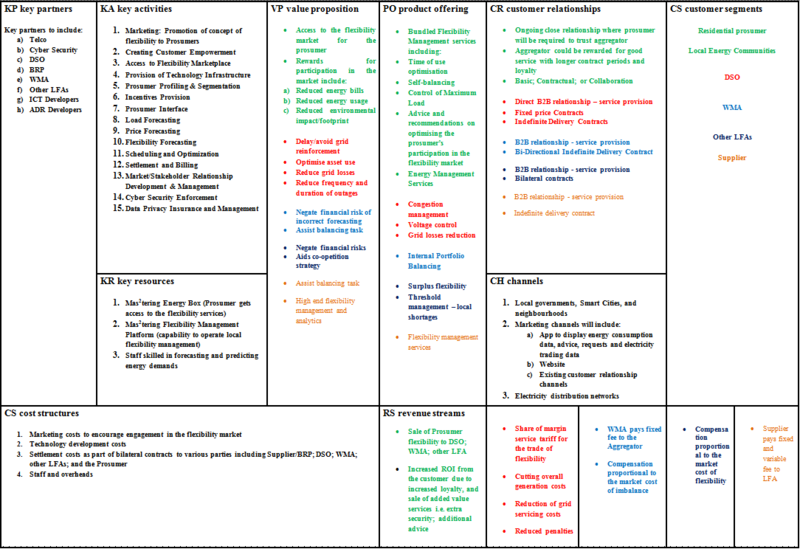 3.1 Interaction Dynamics of Value Chain Functions in the LFM. 3.2.6 Addressing the Remaining Blocks in the Multi-Sided Business Model for the LFA. 4.2 Business Strategies and Collaboration Opportunities in a Market Transition Perspective. 4.2.1 Strategic Forecasting Analysis and Scenario Planning for Phase 2 Growth. 4.2.2 Strategic Forecasting Analysis and Scenario Planning for Phase 3 Maturity. 5.3 Business Model for Mas2tering. 5.3.1 Customer Segments and Market Points of Entry. 5.4 Business Case Formulation: Alignment of Project Use Cases and Subsequent UC Business Models. A.1.3 Strategic Forecasting Analysis and Scenario Planning. Annex B Interaction Dynamics in the LFM..
Utilizing the reference framework of USEF  as detailed in D1.6, Figure 2 provides a contextual and geographical representation of the LFM. There is a significant gap between the markets of today and the LFM presented where local flexibility is used to address congestion, capacity, reliability and efficiency. The problem with the evolution to a functioning flexibility market is that they are the grids of the future and the structure of the market place is uncertain. It will see the integration of the current market-based energy system and its players with new services and roles as described in Table 1. Prosumer The Prosumer is seen as a passive receipent and consumer of energy. End users that provide flexibility. They may act through smart technologies or by changes in behavior. With renewables, they may generate to sell, self-consume or store electricity. Save money and lower their electricity bills. Respect of comfort preferences and desired electricity use. Local Energy Community Aggregate the buying power of individual customers for energy savings. Focus on the integration of renewables. Consumers and Prosumers that join together under a LEC to act in a coordinated way with respect to consumption, generation and storage. Financial and non financial benefits are possible. Potential to be a cooperative entity. Save money and lower their electricity bills leveraging a community approach. Access to the Flexibility Market. Be part of an eco-friendly community. Local Flexibility Aggretor Does not exist Central role in the MSP. Acts as an intermediary between the Prosumer/LEC and the flexibility market. Aggregates flexibility provided by Prosumer and LEC and sells it to the market players that require it. Maximize the value of local flexibility for its portfolio, taking into account customer needs, economic optimization and grid capacity. Maximize profit. Build a client portfolio and position for cross selling opportunities between actors. Wholesale Market Aggretor Manage large amounts of load in a highly dispersed area in order to meet the requirements of producers, suppliers, BRPs and in line with the balancing requirements established by the TSO and the DSOs . Will engage local agents such as LFAs to perform the customer acquisition role and local optimisation of flexibility to sell (Intenal) as a product offering to the WMA who performs the wholesale market role. Maximize the value of wholesale market flexibility for its portfolio, taking into account customer needs, economic optimization and grid capacity. Supplier The role of the Supplier is to source, supply, and invoice energy to its customers. The Supplier acts as the single contract point for access to the electricity market. Maximize its benefit when sourcing, supplying and invoicing energy to its customers. DSO Distributes electricity at MV and LV levels and ensures quality of supply while maintaining grid stability. Acts as a purchaser of flexibility from LFA for congestion management and voltage control. Use LV flexibility as a tool to reduce grid congestion, further ensure the security of supply and improve network capacity planning. Marketing: Because the flexibility market is embryonic, the LFA will have to market and advertise its flexibility services to potential customers and educate the marketplace as to the benefit of engaging in flexibility. Creating Customer Empowerment: Creating flexibility on the customer side will be the key to success of the transition to a new energy paradigm. This will require active participation and empowerment of customers in the energy system. The LFA will have to engage in change behaviour marketing programmes. Access to Local Flexibility Marketplace: The LFA provides the Prosumer with access to the local flexibility marketplace. Provision of Technology Infrastructure: Installs control and communication devices at customers dwelling to facilitate in-home optimisation and access to the flexibility market place. Prosumer Profiling & Segmentation: The LFA will perform an initial study of whether the Prosumers demand response can be profitable by evaluating the appliances/equipment that can participate in demand response. The LFA must be capable of clustering customers in to segments based upon their characteristics and technology and behaviour usage constraints. Incentives Provision: Provides incentives to customers to engage in flexibility. While incentives can be financial, they can also be a contribution to environmental sustainability, an informational incentive around the consumer’s consumption patterns of energy, the desire for greater autonomy and control or a value proposition centred around having the latest cutting edge technologies. Prosumer Interface: The LFA must interface with the Prosumer in terms of consumption data so that the Prosumer has access if they desire it. Load Forecasting: The LFA must be capable of performing a consumption forecast to determine the consumption needs of the LEC. Price Forecasting: The LFA needs to be able to forecast prices for future periods to facilitate planning. Flexibility Forecasting: The LFA must be capable of flexibility forecasting Prosumers response to control signals. Scheduling and Optimization: The LFA decides how to operate its portfolio of Prosumers to maximise profits and generate saving for the Prosumer. Settlement and Billing: Calculates financial benefit to Prosumer and pays a premium for the provision of demand response. Market/Stakeholder Relationship Development & Management: bilateral agreements/ aware of requests for demand response The LFA needs to maintain a close relationship with other actors – DSO and WMA. Cyber Security Enforcement: The LFA must ensure that signals are adequately protected against cyber-attack. Data Privacy Assurance and Management: The LFA must ensure that data privacy regulations are met and that data is anonymized as required. Prosumer – LEC Relationship 2R Individuals sign up to a collective of local householders in order to manage the flexibility commodity (sale & settlement thereof). The LEC can be viewed as an entity or cooperative (such as a building block). LFA – DSO Relationship 4R Flexibility Service Contract. The agreement governs the use of flexibility and settlement. In the delivery of flexibility services, two types of Flexibility Service Contracts are envisaged explicitly Fixed Price Contract and Indefinite Delivery Contract. DSO – LFA Settlement 4S Buying Flexibility for congestion management, voltage control and grid losses reduction. A fixed price contract will be a higher premium product. Indefinite delivery contract will involve a fixed fee & variable fee. LFA – WMA Relationship 5R A Bi-directional Indefinite Delivery Contract will be in place which governs the use of flexibility and settlement. This type of contract provides for the LFA to deliver services upon issuance of a request as the needs arise. This is a short activation time period such as hour-ahead. WMA- Supplier Data 6D Information exchange. In order to forecast future portfolio consumption, the Supplier needs to receive information from the WMA on the activation of the LFAs customers. This ensures that the Supplier can distinguish between LFA initiated DR that requires balancing actions or usual consumption changes that requires no balancing. WMA- Supplier Settlement 6S WMA pays compensation to the Supplier based on market-based pricing of flexibility. Prosumer – Supplier Settlement 7S The Supplier agrees commercial conditions with its customers for the supply and procurement of energy. Prosumer receives a reduction in their energy bill for changing their load profile. Prosumer – Supplier Data 7D Consumption Data. When flexibility contract is activated with the LFA, the Prosumer should inform the Supplier. Prosumer-DSO Data 8D There is a data flow from the Prosumer to the DSO. Data is used to calculate distribution charges, but does not have a particular use as part of the Mas2tering solution. There are five sides to the LFA-MSP – Prosumer; DSO; WMA, Supplier & Other LFAs and each side has distinct product offerings. As they are designed for different customer segments, these products therefore require unique value propositions and create individual revenue streams. 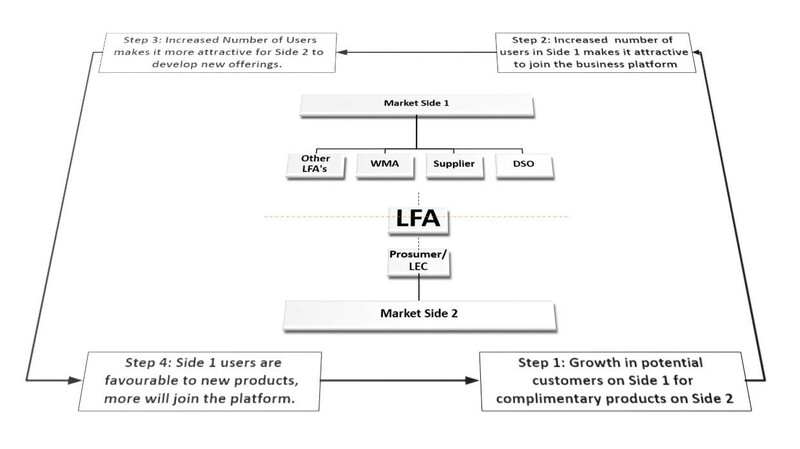 Figure 6 presents the multi-sided business model for the LFA, depicted with its nine building blocks . To illustrate linkages related to the five customer segments, we have colour co-ordinated data under the Value Proposition; Product Offering; Customer; and Revenue blocks in the canvas. Outside of these blocks, the LFA will have Activities that it needs to be able to carry out in order for the business model to function and contemporaneously it will require certain Resources in order to be able to carry out those Activities. These Activities and Resources will lead to certain Costs and these are documented in the Canvas along with the Partners required and the Channels that will be used to communicate with all external stakeholders including customers. To explain the LFA-MSP, we will explain each side of the MSP individually. In this fashion each side can be looked upon as a mini-business model within the overall LFA-MSP. The mini-business models presented will focus on four building blocks: Value Proposition; Product; Relationship Type; and Revenue Model. Following this, we will address the other building blocks within the LFA-MSP. Conceptualized and developed the LFA business model opportunity as a multi-sided platform. This type of business model is relatively new and how to structure it, ignite it, and fully deploy is not yet commonplace. Applied to flexibility management, the impact is that it allows us to move beyond the question of “is load shifting a viable business?” to a broader view of the value brought to multiple actors in an electricity market redesign and how that can be made into a viable business at the LV grid level. Conducted a VNA to fully define the flows and interactions that make up the LFA business model. It has up to five sides in which the LFA can make business with Prosumers, LECs, WMAs, DSOs and Suppliers. Mini-business models between the LFA and each side of the platform are presented consisting of the value proposition, product offering, revenue model and relationship type. Functions and activities are detailed. Barriers and challenges are examined. The impact is that this analysis makes it more clear for any organization how to think about assuming the role of the LFA and making use of the LFA business model opportunity. Presented a view on how the market will transition from where it is today, to pass through a growth phase and eventually to a fully functioning flexibility market. In this view, Suppliers and aggregators work in very different ways. Suppliers focus more on client retention/acquisition and penetration into energy management services (Competitive Clusters) whereas aggregators focus more on flexibility trading and client portfolio creation (Vertical Markets). Eventually, these parallel efforts merge and this is a sign of the transition to market maturity. The view on how the market will evolve is important because it helps more clearly identify the business strategies and collaboration opportunities between actors at different points of time and these are presented. It also provides the rationale for why particular actors may assume the role of the LFA and this is also presented. It also provides insights to market points of entry for various products, services or technologies. This is discussed and its application to Mas2tering becomes a Section of the document (see Section 5). The VNA and flow maps clearly show a more sophisticated customer and a significant recharacterization of the energy market design. As energy, information and revenue flows can happen in various combinations, the nature of value has changed as there are far more types of reciprocal value and combinations of actor exchanges to deliver value. Moreover, as new types of reciprocal value will be generated, new value added businesses and services and new participants to the ecosystem that traditionally would not have been directly involved in the industry will emerge. In comparison to the traditional utility model, the complexity of this recharacterization of the industry ecosystem is significant. To date, energy market actors have primarily focused on technology advancement which is within their comfort circle, however, this recharacterization will also require a call to action to engage in business model transformation which is new to most. Empowered by ICT, analytics and smart technologies, the emergence of the Prosumers and LECs as active participants in the energy value chain is disruptive to the current ecosystem and may herald the era of multi-sided platforms. There is growing evidence that Prosumers will demand more from their relationship with the energy value chain than just payment for energy consumed and there exists an element of prosumers / LECs wanting to have more control / recognition for their role in the value chain. This presents an opportunity for new market participants to enter the marketplace and also provides a call to action for market incumbents to innovate their products/services to meet this new type of market demand. The role of the LFA can be seen as a ‘match-maker’ in the recharacterisation of the existing market model, through the introduction of an MSP. Herein lies the real business opportunity in the LFM. The LFA-MSP developed in this research can be adaptable to different types of stakeholder ownership. In this fashion, the MSP can be seen as an opportunity for exploitation. The Growth Phase (Competitive Clusters and Vertical Markets) of the market transition will persist until there is a trigger and/or tipping point toward market maturity. Although this may happen via normal market processes, it can be accelerated either via government subsidies, a disruptive technology or a combination of both. A potential disruptive technology is the flexible-friendly electric vehicle. As the market transition and future electricity market will unlock value, new jobs and new innovations will be created. Governments at all levels can benefit from a proactive posture as opposed to a passive posture. Once ignited in a fully functioning flexibility market, the LFA-MSP has immense potential to unlock value and facilitate collaboration opportunities between stakeholders. Until that time however, access to market participation and the resultant innovation potential is limited. The results of the Business Case Evaluations and ensuing Business Case Recommendation will be presented in D1.7. In addition, this report provides strong input to WP7 exploitation activities. In particular, we now know that the most promising exploitation path for the Mas2tering platform (potentially coupled with the energy box) is the WMA operating in a country with high flexibility potential and looking to add residential flexibility to their flexibility portfolio. This enables a sharpening of the market analysis and development of exploitation planning.